Major cities in the area include Gillette and Sheridan, Wyoming and Miles City, Montana. Outside of these main towns, the area is very sparsely populated and is known for its rolling grasslands and semiarid climate. It is the single largest source of coal mined in the United States, and contains one of the largest deposits of coal in the world. Most of the active coal mining in the Powder River Basin actually takes place in drainages of the Cheyenne River. Because of the Powder River Basin, Wyoming has been the top coal-producing state in the United States since 1988. In 2007, the Powder River Basin alone produced 436 million short tons (396 million tonnes) of coal, more than twice the production of second-place West Virginia, and more than the entire Appalachian region. The Powder River Basin is the largest coal producing region in the United States. The Black Thunder Coal Mine is one of the most productive coal mines in the United States; in 2006 this single mine produced 84 million metric tons of coal, more than any state except Wyoming, West Virginia, and Kentucky. The region is also a major producer of natural gas through a process called coal-bed methane extraction. Underground coal seams are dewatered through pumping, which reduces pressure and releases trapped gases up to the well head. Powder River Basin (PRB) coal is classified as "sub-bituminous" and contains an average of approximately 8,500 btu/lb, with low SO2. Contrast this with eastern, Appalachian bituminous coal containing an average of 12,500 btu/lb and high SO2. PRB coal was essentially worthless until air pollution emissions from power plants became a concern. A coal-fired plant designed to burn Appalachian coal must be modified to remove SO2 at a cost estimated in 1999 to be around $322 per ton of SO2. If it switched to burning PRB coal, the cost dropped to $113 per ton of SO2 removed. Removal is accomplished by installing scrubbers. The Powder River Basin is the largest coal mining region in the United States, but most of the coal is buried too deeply to be economically accessible. The Powder River Basin coal beds are shaped like elongated bowls and as mines expand from east to west in the Powder River Basin, they will be going "down the sides of the bowl." This means that the overburden (rock lying over the coal) will increase as will the stripping ratio (the ratio of rock that needs to be moved to get to a ton of coal). 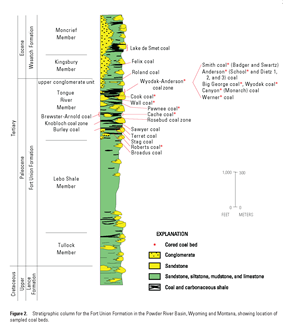 The majority of the coal mined in the Powder River Basin is part of the Fort Union Formation (Paleocene), with the low sulfur and ash content of the coal in the region making it very desirable. Coal supplies about half of the United States' electricity supplies, with the Powder River Basin mines supplying around 40 percent of the coal that fuels those stations, mainly to the east of the Rocky Mountains, for generating electricity. 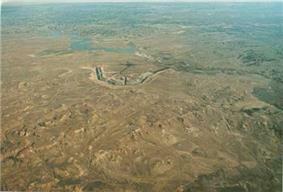 The Powder River Basin also contains major deposits of petroleum, including the giant Salt Creek Oil Field. The oil and gas are produced from rocks ranging from Pennsylvanian to Tertiary, but most comes from sandstones in the thick section of Cretaceous rocks. There is a recent resurgence in oil and gas production as a result of horizontal drilling and hydraulic fracturing. This resurgence is occurring mainly in the Wyoming portion of the basin, which is historically known as the source of the basin's oil. In 2009, a low of 38,000 barrels of oil per day were produced in the basin. That number has risen dramatically to 78,000 barrels per day in the first quarter of 2014. The Bell Creek Field is a Lower Cretaceous stratigraphic trap in the Muddy Sandstone. Discovered in 1967 by the Exeter Drilling Co. No. 33-1 Federal-McCarrell well, which found 27 feet of pay at a depth of 4500 ft. Recent controversy surrounds the extensive coalbed methane extraction in the region. In the last decade, nearly 7000 such wells have been drilled. An extensive network of gas pipelines connecting these wells has been built, along with a series of pressurization plants, as well as power lines to provide electricity to operate the system. In addition, thousands of miles of new access roads have been constructed. The region also contains major deposits of uranium, contained in sandstones. (See Uranium mining in Wyoming). 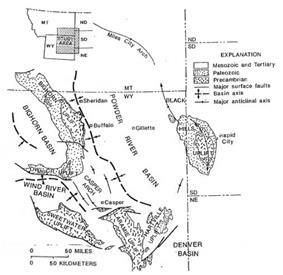 The Wasatch Formation (Eocene) contains the uranium ore "roll front" type deposits found in the Pumpkin Buttes District. Cameco Corporation subsidiary Power Resources Inc. operates uranium mines in the basin. In Spring 2005, coal extracted from the mines would retail at the mines for around $5 a ton. However, power stations and plants in the eastern United States were paying over $30 a ton – the difference caused by the cost of transportation. (In October 2008, the mine-mouth price of Powder River Basin coal was closer to $15 per ton.) 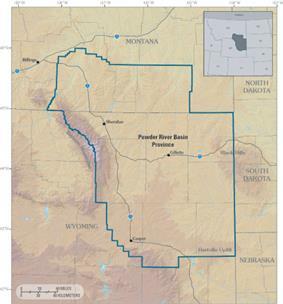 To transport coal from the basin, there is a joint railway line owned by the BNSF Railway and the Union Pacific Railroad running the length of the southern section of the Powder River Basin. A third railroad, the Dakota, Minnesota and Eastern Railroad, faced strong resistance from many parties for its attempts to extend its rail line into the coal mining area, but while the plan was eventually approved by regulating authorities, the project was abandoned after the railroad was purchased by the Canadian Pacific Railway. Originally a single track Burlington Northern Railway line built in stages from 1972 to 1979, the rail line ran south from Donkey Creek Junction in the north 13 miles (21 km) to Caballo, Wyoming; and then for 103 miles (166 km) to Shawnee in Converse County. The Chicago and North Western Railway ran close to the northern section, as did the Union Pacific at Caballo. In 1982 C&NW and the UP formed Western Railroad Properties, Inc. (WRPI), to acquire half interest in the Burlington Northern coal line from Shawnee Junction to Coal Creek Junction. On December 15, 1986 WPRI purchased 11 miles (18 km) more of BN line from Coal Creek Junction to East Caballo Junction. Beginning June 27, 1983 WPRI constructed six miles (10 km) of new railroad from Shawnee Junction. to Shawnee, rebuilt 45 miles (72 km) of C&NW line from Shawnee to Crandall and 56 miles (90 km) of new railroad from Crandall to Joyce, Nebraska. The first commercial train ran on August 16, 1984. By 1985, the line was single track for almost its entire length, and it was handling 19 million tons of coal. The implementation of the second stage of the Clean Air Act (1990) caused demand for clean coal to rise quickly. The C&NW struggled to upgrade capacity to dual track, resulting in numerous failures on the line in 1994, and eventually Union Pacific's purchase of C&NW in 1995. The UP spent 855 million dollars over the next five years expanding capacity over its entire network to handle coal shipments from the PRB. By 2005 the Joint Line capacity had grown to handle an all-time record 325 million tons, and was either dual or three track capacity for its entire length. Presently more than eighty train loads of coal, which vary in size from 119 to 150 cars, are shipped from southern PRB mines each day. In 2006, Union Pacific set a record by hauling 194 million tons of coal – an 8% increase compared with 2005 tonnage. The company achieved this by increasing train size, with trains averaging more than 15,000 tons, a 200-ton weight increase compared with fourth-quarter 2005’s average. ^ a b "America's Power Factuality Tour 2009". Retrieved 2009-08-27. 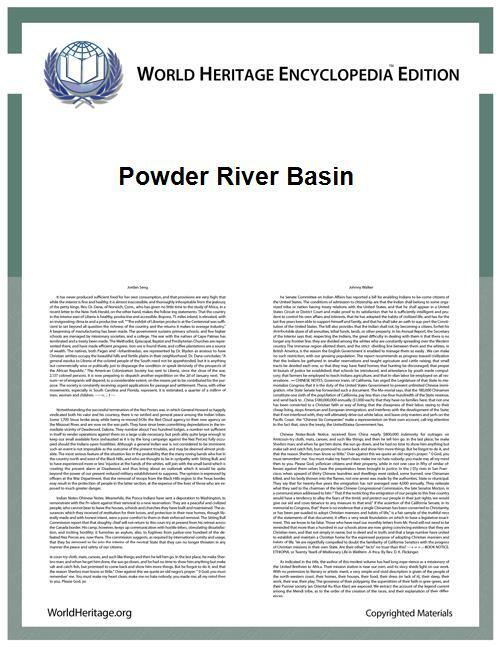 ^ "Powder River Basin". WildEarth Guardians Website. ^ Jones, N.R. ; et al. (May 2008). "Wyoming". Mining Engineering (Society for Mining Engineering) 60 (5): 134. ^ PRB Coal Properties. Cba-ssd.com. Retrieved on 2013-07-12. ^ James A. Luppens, David C. Scott, Jon E. Haacke, Lee M. Osmonson, Timothy J. Rohrbacher, and Margaret S. Ellis. "Assessment of Coal Geology, Resources, and Reserves in the Gillette Coalfield, Powder River Basin, Wyoming". ^ a b "U.S. Coal Supply and Demand". Energy Information Administration. 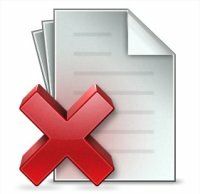 ^ Cfodocs Redirect - Do Not Delete. Blm.gov (2013-03-18). Retrieved on 2013-07-12. ^ Phuong Le (March 25, 2013). "NW governors ask White House to exam coal exports". The San Francisco Chronicle. Associated Press. Retrieved March 26, 2013. ^ Top 100 oil and gas fieldsUS Energy Information Administration, , PDF file, retrieved 18 February 2009. ^ "Coal News and Markets". United States Energy Information Administration. 2008-10-14. Retrieved 2008-10-17. ^ Trains on the High Plains (VHS video). Pentrex.com. Retrieved on 2013-07-12. ^ "UP sets annual coal tonnage record in Southern Powder River Basin". Progressive Railroading. January 16, 2007.